Among cliffs and salt water, painted in the most beautiful colours of the archipelago, is where you’ll find this Bohuslän idyll on the western side of Tjörn. 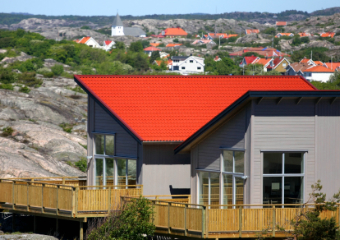 Resting securely on the surrounding Bohuslän granite and with the North Sea as your neighbour, it doesn’t get more west coast than this. 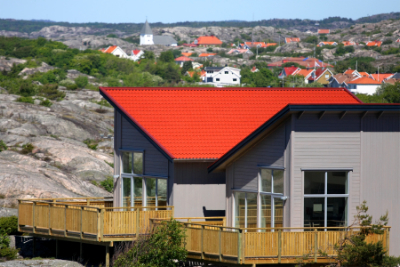 We invite you to come and visit Bohuslän! 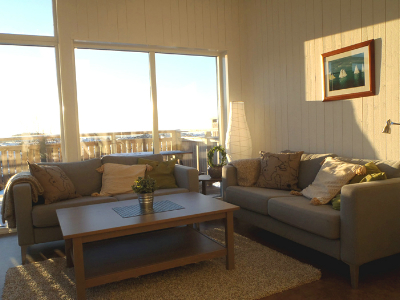 Does the proximity to the sea entice you? A short five minute bike ride from the campsite and you will find yourself by the most beautiful swimming area on Tjörn. Crab fishing, swimming from jetties and diving towers can be enjoyed in the small picturesque fishing hamlet of Stockevik. The nearby islets and surroundings of the much frequented harbour of Skärhamn offer lovely swimming possibilities. Why not follow our path on a walk down to the sea? Enjoy the serenity and an early morning swim before breakfast and coffee invite you to enjoy yet another summer’s day in Bohuslän. After a day packed with events, family and friends can gather at our barbecue spot by the sea. Freshly barbecued delicacies while the sun sets in the North Sea, what more could you ask for? If they’re not heading to the sports ground to play some ball, perhaps they are busy playing at our newly built little playground or running down to the sea which can be found a good stone’s throw from our campsite. 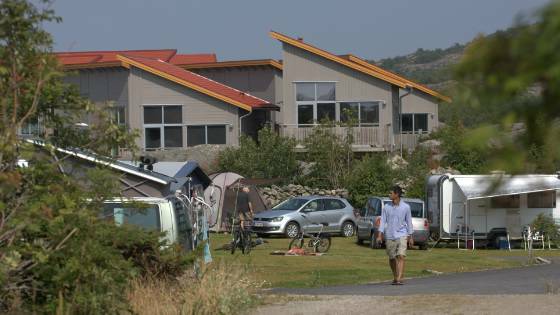 The campsite is located in a large area for country walks, an Eldorado for children when it comes to exploring the surroundings, climbing the mountains, or perhaps building a hut. Here children can be children and the summer holiday can last an eternity. 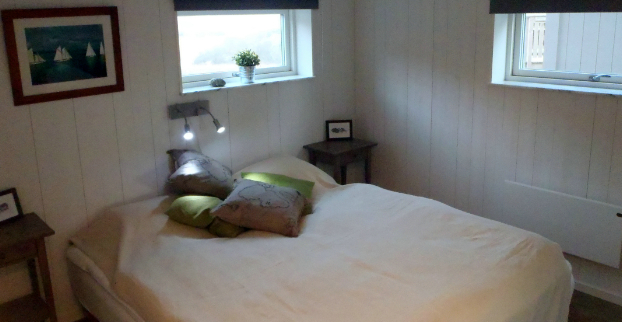 With some of the best sea trout fishing on the coast and sea fishing recovering with both cod and mackerels, our houses is the perfect accommodation alternative if you want to stay close to the fishing grounds. With 500 metres down to the cliffs, and the sea trout biting on a peaceful spring morning, what else could you want for? 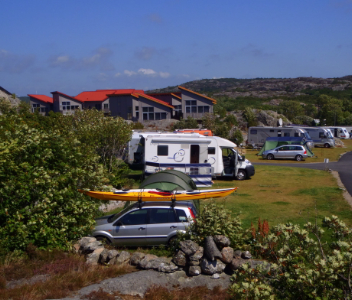 Experience Bohuslän and the west coast, Tjörn from their best side from our campsite. We are open all the year round, giving you the chance to enjoy all seasons! 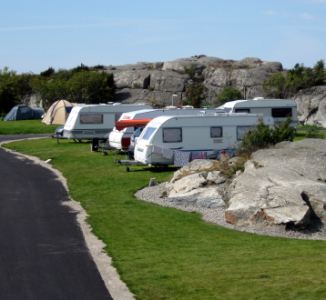 The campsite has a total of 35 pitches for caravans, motorhomes and tents. 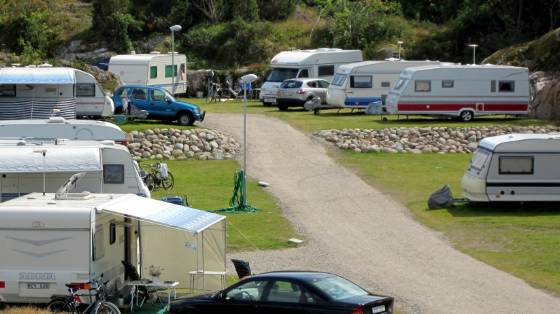 The camping pitches are spacious terraced grass areas surrounded by paving. There is also space by the camping pitches to park your car next to your caravan/motorhome or alternatively pitch a foretent. All pitches have access to electric hook-ups (10A) and cable TV. 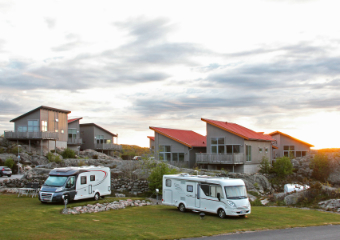 Our campsite on the island of Tjörn is located 1.5 km south of Skärhamn, the cosiest harbour on the west coast. The modern service building on the grounds gives you access to new fresh WCs and showers. 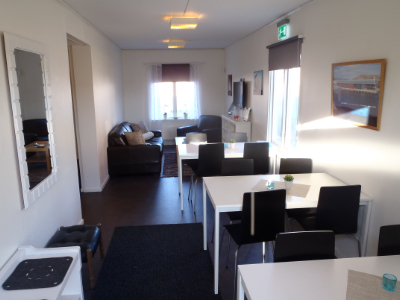 There is a laundry room and a nice kitchen with common room and TV. Sit on our patio outside the kitchen and enjoy the sunshine and nature while breathing in the fresh west coast air. The award-winning Nordic Watercolour Museum is located just a few minutes’ walk from the campsite. 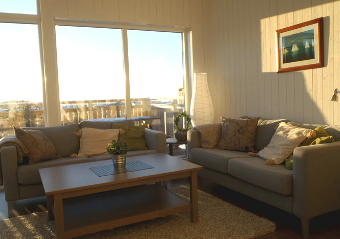 This is where art from every corner of the world meet the stunning Tjörn nature. Park your car by Kyrkesund and catch the ferry to Härön with its beautiful surroundings. From Rönnäng in the south the ferry takes you to the islands of Åstol and Dyrön. Åstol is the islands where the houses are located close to one and other and the mood is always high. The cosy harbour has a restaurant with its own smokehouse and is filled with holidaying boats during the summer season. Dyrön is the more peaceful of the two, a real idyll with woody greenery. Charming Klädesholmen is best known for its herring though you can also enjoy restaurants and saunas here. Further out in the archipelago is the island of Marstrand and the Pater Noster lighthouse. Among the cliffs of Bohuslän sits this idyll on the western side of the island of Tjörn. 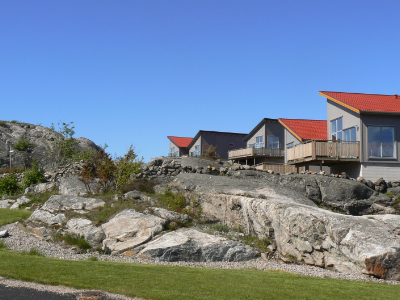 Enjoy scenic surroundings, safely nestled among the Bohuslän granite. 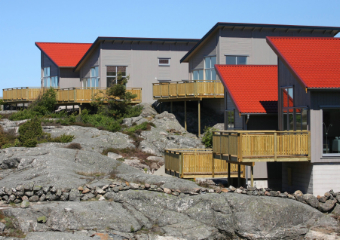 Our 15 architect-designed houses sit freely up on the rocks surrounded by nature. 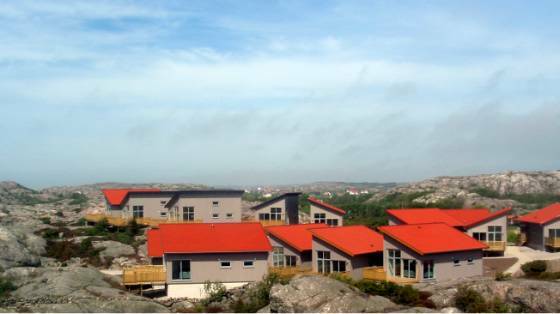 The houses have 7 beds over 2 rooms, and a sleeping loft, fully equipped kitchen, shower/WC, satellite TV, and a patio. 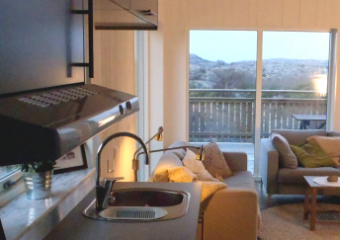 Parking spot is included with the accommodation and there are also barbecue spots. In total, the campground with 35 pitches for caravans, motor homes and tents. The camping pitches are spacious so you can park your car next to your caravan / motorhome or alternatively put up an awning. All pitches have access to electricity (10A) and cable TV and to our modern service facilities with new toilets and showers. 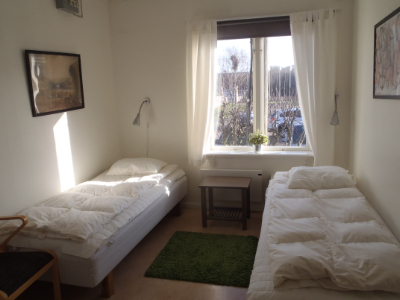 There are a total of 11 double rooms, with room for 22 people. The kitchen is shared, you share it with others staying at the hostel. 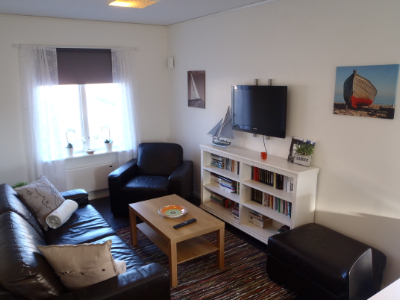 There is also a communal TV room and a patio where you can relax in the afternoon sun. Obviously it is possible to rent linen and towels at the front desk when needed. Rent one of our newly built architect-designed family house. 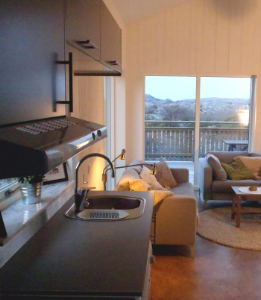 The houses are complete with well-equipped kitchen, TV and a private patio. 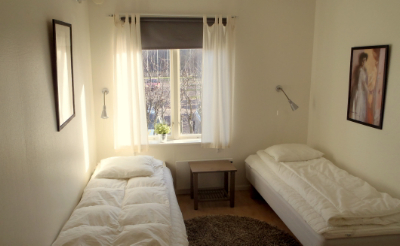 Each house has 6 beds with possibility of 1 extra bed. 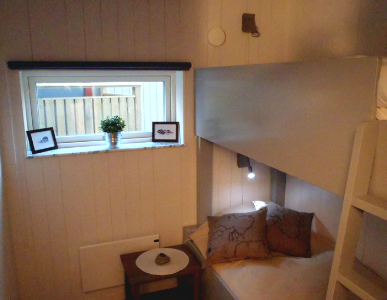 The one bedroom has a double bed and one bunk bed. 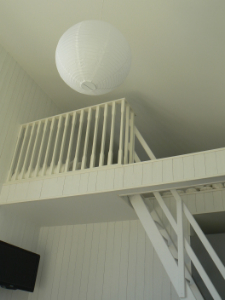 Other beds are upstairs in the loft. 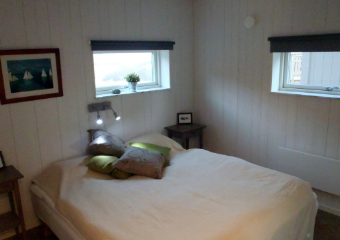 The cabins are 45 m2 excluding loft. In some of the houses pets are permitted. If you need to rent linens and towels, you can do this at the reception.